The first Silestone* Collection, manufactured with N-boost technology by Cosentino, has been launched. The new collection is called Eternal and it comprises a range of colours that pay homage to exotic marbles in the natural stone sector. 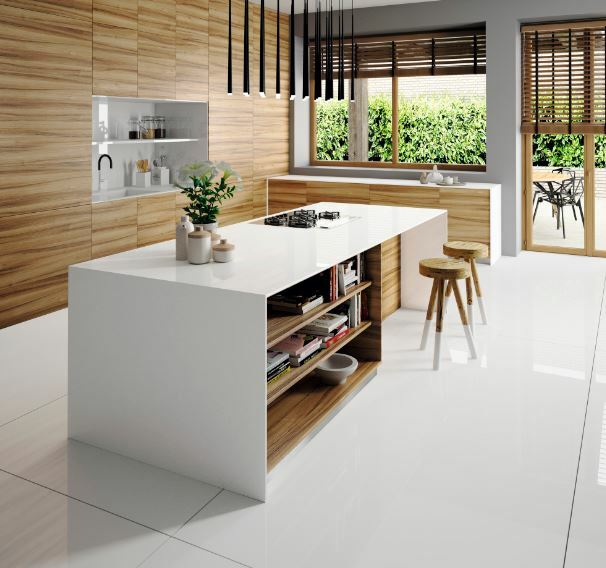 N-Boost technology is an innovation patented by Cosentino which modifies the surface of the material at a molecular level and further enhances the product’s technical and aesthetic properties. Besides a greater intensity of colour and surface brightness, the technology simplifies the cleaning and maintenance process, thanks to the water repellent property of the material. The six colours in the collection are Eternal Calacatta Gold, a colour made up of a white background through which elegant, wide grey highlights are interspersed with unexpected golden glints. Eternal Statuario is inspired by the classic Italian Carrara marble and has a white surface with very soft, sparkling highlights in a shade of grey. Charcoal Soapstone, inspired by the popular “soap stone”, has a blue-grey finish with powerful, grey highlights. Pearl Jasmine, Eternal Serena has a finish of grey stone with fine, gentle, white lines drawn through to its depths and Eternal Marquina is evocative of the beautiful, Spanish Black Marquina marble, which presents an intense, black background with convincing, intense, white details and highlights which rise to the surface. The colours reflect a new trend that is making its mark on the world of decoration and interior architecture, namely “revival”. This trend is based on a commitment to the beauty and timeless naturalness of authentic, historical materials of which marble is a prime example. Cosentino’s R&D department dedicated a lot of time and resources to making sure the new collection has an extraordinarily natural appearance in which the different highlights play an essential role in the overall effect. The company has achieved penetrating patterns of highlights, visible from the surface right through to the depths of the slab, even at intersections and edges. Furthermore, the patterns of highlights are faithfully repeated with each round of production so as not to lose one iota of the original essence of the design. The new collection has a number of mechanical properties that are also beneficial, such as high resistance to impact and scratching, the ability to be manufactured in large size formats, and versatility of application. Silestone maintains the international certifications which accredit its quality, namely Greenguard and NSF. For more information, contact Dekton on +27 (11) 974 8914 or via www.dekton.com.